It's beginning to look a lot like Christmas around the ACTS Thrift Store, and I for one am stoked! This is hands down my favorite time of year and I just love giving everyone on my nice list that perfect "thing" that has them written all over it. In the back of my mind though I say to myself " Self? is it just a bit naughty to gift from a thrift?" 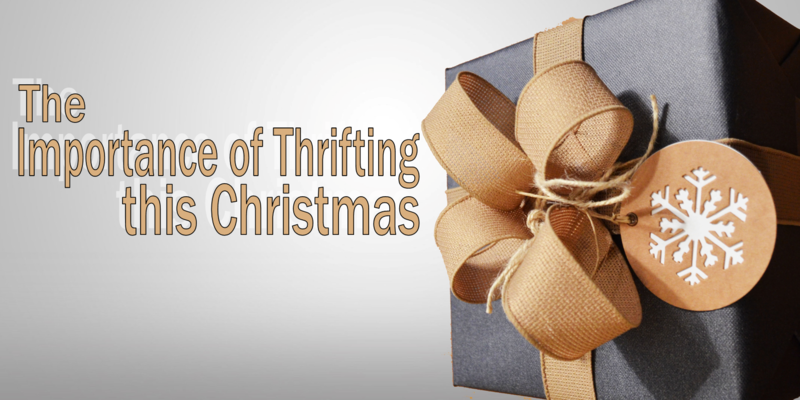 For this month of sharing I will be giving my top ten reasons thrifting is a go this season. Shop for good! Your purchases help fund charitable causes. Melissa Napora runs our food pantry and deserves a big round of applause for just wrapping up ACTS' largest annual food drive. Operation Turkey ran from November 1st through the 18th this year, and during that time, the Food Pantry served over 700 families. ACTS assists families in Prince William County with homelessness, energy assistance, clothing, domestic violence, sexual assault, and suicide related support. So not only are you helping yourself to great treasures at awesome prices, you are also helping your neighbors through hard times with every purchase! Shopping second hand sets a great example for your kids. The value of thrift, creative reuse, and community support are indeed noble lessons! Any parent having littles at home knows that the packaging that encases new toys on Christmas day is just evil to the average toddler so it will not be missed. As parents we also know that little people have the attention span of butterflies flitting from flower to flower. This means practically new toys can often be found at rock bottom prices! If you’re a vinyl collector, you already know certain records are worth big bucks. ACTS thrift store gets record collections donated. They then put these items out for sale in bulk without necessarily examining each individual album. If you find a record by Led Zeppelin, The Beatles, The Temptations, or Elvis, for instance, it’s likely that you’ve found a treasure. According to CBS Local, The Freewheelin’ Bob Dylan (Withdrawn Version) is worth between $20,000 and $30,000. Even if you find records by a lesser-known artist, there a chance it’s worth more than its price, so look it up and check out its value. You may even stumble upon a priceless treasure like you and your honey’s first dance as husband and wife album. Or the song you may have danced to with your high school sweetheart at prom. According to Abe Books, a book’s value increases if it is in good condition, if it’s a first edition, and if it’s rare, as well as for those published during and after the 20th century if it has a dust jacket. For example, the original The Lord of the Rings, first U.K. edition, first impression, with dust jackets and a custom clam-shell case is priced at $28,000. While you most likely will not find that book, if you keep an eye out, you may find others of value. Cashmere sweaters, preshrunk designer jeans, adorable summer skirts, vintage little black dresses, chic leather jackets, unique accessories – did you just die and go to budget fashionista heaven. No, just a trip to ACTS. I could ramble on forever about my awesome thrifting finds, but I wouldn't do that to you. So I will just leave you with this. Retail prices hurt! Saving 75% on retail is just like getting a 75% return on your money and that feels good. Those second-hand jeans are already broken-in and everything is prewashed and preshrunk. So when a piece of ACTS Thrift Store clothing fits you in the store,(like a glove) you know it’ll fit when you get it home. I for one hate buying new clothes that fit great for one wash and then never again! In need of a fantastic piece of costume jewelry,a cocktail ring, or a vintage pair of clip earrings? Thrift stores offer a wealth of possibilities. Unique and cool things can always be found at ACTS, from brooches and cameo rings to re-purposed spoons as bracelets! There's nothing like the thrill I get from leaving the thrift store and knowing I got something truly, truly special. In a world where about three other people on the subway are wearing some sort of variation of my jacket, it's nice to know I've got something that's one-of-a-kind. Thrifting is recycling at its most basic and beneficial level! ABC News estimates that 98% of the clothing purchased in the U.S. comes from abroad. That means that a sweater hanging on the rack at a department store traveled thousands of miles, using up energy and polluting the planet with coal and natural gas along its way to the store and ultimately an American closet. In contrast, buying second-hand clothing produces a significantly smaller carbon footprint. While the sweater may first have came from thousands of miles away, it likely made itself into the shop after someone in the community wore it and then donated it to the shop. The only carbon emissions associated with that sweater is the fuel it took the donator and the shopper to drive to the store (even less if that person walked, biked or took public transportation to our store). Buying and using gently worn clothing follows one of the principals of the environmental friendliness: reuse. It also keeps those items out of landfills. Packaging associated with brand new items often ends up in landfills, as well. Anyone who has ever bought something new knows those products come with a lot of packaging be it plastic, tissue, tags, etc. Gently worn items purchased in ACTS thrift shop eliminate that unnecessary packaging. ACTS shopping reduces the carbon footprint while reusing items and saving shoppers money. Thrifting at ACTS is arguably the most local and sustainable form of commerce. So, these are my top ten reasons to continue thrifting in the month of giving, what are some of yours? Do you have any tricks that lead to top picks? Do tell. I am always looking to perfect my craft.